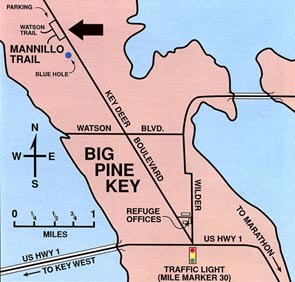 Big Pine in the Florida Keys is known for its Key Deer. 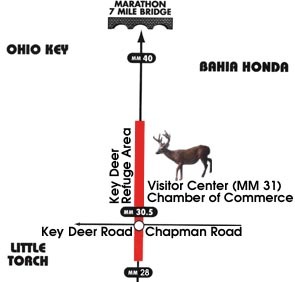 If you are driving through the keys, you can not help noticing that you are approaching the National Key Deer Refuge because the speed limit changes from 45 MPH to 30 MPH at night. This speed limit is strictly enforced by law enforcement. This area is from Mile Marker 29 to Mile Marker 33. The shoulder height of Key deer is between 24-32 inches. Does weigh 45 to 65 pounds while bucks weigh 55 to 80. Rutting season activities begin in September, peaking in early October and decreasing gradually through November and December. Some breeding may occur as late as February. The gestation period is 204 days with fawns born April through June. At birth fawns weigh 2 to 4 pounds. Antlers on mature bucks are dropped February through March, and re-growth begins almost immediately so that by June, bucks with 2-inch stubs are seen. Antler growth is completed by August, and velvet is rubbed and kicked off in early September. They feed on native plants such as red, black and white mangroves, thatch palm berries and over 160 other species of plants. 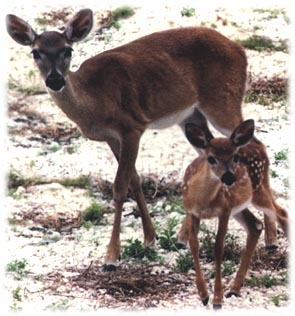 Key deer can tolerate small amounts of salt water, but fresh water is essential for their survival. They must also have suitable habitat to ensure their future existence. 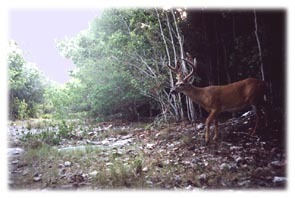 No records exist documenting the origin of the deer in the keys. 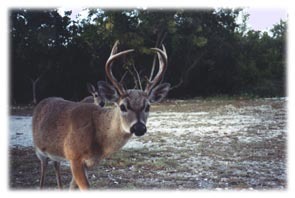 It is believed that the deer migrated to the keys from the mainland many thousands of years ago, across a long land bridge. As the Wisconsin Glacier melted, the sea rose dividing the land bridge into small islands now known as the Florida Keys. Instead of stopping along a busy section of state highway, officials recommend that visitors travel to the north end of Key Deer Blvd. or to the east end of Watson Blvd. on No Name Key. 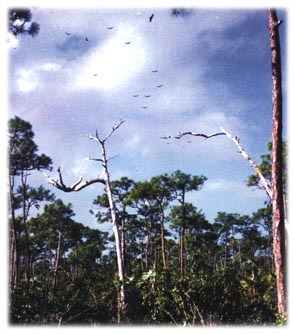 This area is part of National Key Deer Refuge and offers safe viewing. Key Deer Protection Alliance, Inc.
Much of this information was obtained from the U.S. fish and Wildlife Service publication "Facts on the Key Deer", which is available at their information center.